This is an extremely well-maintained fleet; bidders will be very pleased with the selection available. HYPERAMS, LLC, in partnership with Tiger Group, is conducting the first of two online auctions of the assets of Central Grocers, a retailer-owned cooperative that operated as a wholesaler for approximately 400 independent grocery stores in the Midwest. 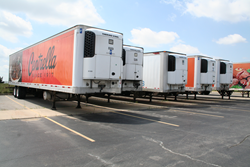 The online auction features over 180 well-maintained, late-model dry and refrigerated trailers ranging in size from 35 feet up to 53 feet in length. Brands include Wabash, Great Dane, Trailmobile, and Utility. Wilber noted that although this auction includes the trailer assets of Central Grocers only, the second auction, which is anticipated to be held in a few months, will have additional equipment. “Bidders interested in expanding their distribution facilities should note that the second auction will include additional trailers, as well as facility racking, forklifts, and more,” he said. The online auction for the trailer assets is currently ongoing on Bidspotter.com. Lots will begin to close August 23, 2017 at 10:00 AM CST. An inspection day has been scheduled for August 22, 2017 from 8:00 AM to 4:00 PM CST at the Company’s distribution center located at 2600 W Haven Avenue, Joliet, Illinois 60433. As mentioned, due to the expansive asset list and anticipated high auction participation, a second online auction will be scheduled for certain of the company’s distribution and warehouse equipment. For more details on the assets and how to register for this highly-anticipated auction, please visit http://www.HYPERAMS.com or contact Director of Auction Services Burdette Wilber at bwilber(at)hyperams.com. Central Grocers Inc. filed for voluntary bankruptcy on May 4, 2017. Please reference U.S. Bankruptcy Court, Northern District of Illinois (Case Number 1:17-bk-13886) for more information. HYPERAMS is a full-service auction, appraisal, retail advisory and liquidation, and reverse logistics firm. The Company specializes in assisting both distressed and healthy companies manage surplus assets by providing clients with a complete asset disposition strategy. The Asset Disposition division focuses on investing in excess assets and conducting live and webcast auctions. The Appraisal division provides valuations of machinery, equipment, and inventory in most industry verticals. Since its inception, HYPERAMS has performed hundreds of appraisals, auctions, and store closings on behalf of financial institutions, restructuring/turnaround professionals, private equity firms, as well as business owners.